Howard Schultz is frustrated. So am I. But Schultz is frustrated that the two parties can’t come to an agreement about fiscal policy. I’m frustrated that Schultz still thinks the two parties are equally to blame for the impasse. And I’m frustrated that Schultz isn’t the only one who thinks that way. Schultz, as you may know, is the CEO of Starbucks Coffee. He appears to be one of the good guys in corporate America and he treats his employees well, by, among other things, providing even part-timers with health insurance. But he's become obsessed with bipartisanship and the need for more of it. His latest effort in the campaign came on Wednesday, when he instructed baristas all over Washington to write the phrase “come together” on every cup of coffee they sold. He wasn’t thinking about the Beatles song. It’s the same claim you keep hearing on talk shows—that the parties need to get past their supposedly petty differences and govern responsibly. And if you have read my colleague Noam Scheiber’s piece on Maya MacGuineas, who has been making this argument as long as anybody, you know why it is so misguided. One party, the Democrats, is already acting responsibly. And one party, the Republicans, is not. In the last few weeks, President Obama has offered major concessions, agreeing provisionally to reductions in Social Security benefits in exchange for tax increases on investments along with more financial support for poor and middle-class families. Either that deal or a more narrowly tailored one, one that addressed only the automatic spending cuts and tax increases that neither party likes, could probably pass Congress tomorrow—if only House Speaker John Boehner was willing to pick up the phone and get help from Minority Leader Nancy Pelosi, who could almost surely supply enough Democratic votes to get such a bill through the House. Boehner won’t do that, because tax rates on upper incomes would increase under such a deal. A small portion of Boehner’s caucus still hasn’t come to terms with the fact that President Obama campaigned, and won re-election, on a promise not to renew expiring tax cuts for the wealthy. If Boehner defied that group and passed a bill with substantial Democratic support, he might lose Republican votes on January 3, when he makes his bid to remain at speaker. To be speaker, you need votes from a majority of all members, not just a majority of your caucus; if Boehner lost the votes of just two dozen House Republicans, he’d lose his bid. 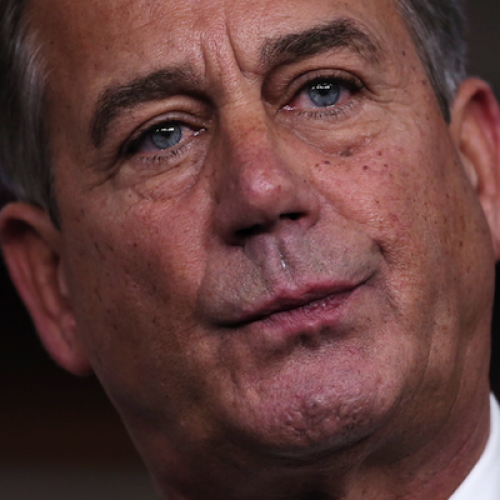 I can’t see into Boehner’s mind, obviously, but it would appear he’s unwilling to take that risk. Nobody in Washington seems to think that’s the least bit strange. But sometimes leadership means pushing your supporters to do something they might not like, because you believe it’s in the country’s best interests. And sometimes leadership means putting your own political fortunes in jeopardy, because doing so is the only way to take action. All politicians act out of self-interest. But the best ones take chances, and act boldly, at least once in a while. Just ask Pelosi, who dutifully rounded up Democratic votes for President Bush’s financial industry rescue in late 2008. Or ask Obama, who stuck with health care reform even when his members of his own party were advising him to back off. If you want yet another window into the two parties—and their relative willingness to make concessions—think about the way each one has come to terms with the original Bush tax cuts, whose imminent expiration has helped forced this debate upon Washington. Back in 2001, Bush and most of his Republican allies wanted to enact a permanent, across-the-board income tax cut. Most Democrats opposed the proposal, because they believed it would skew benefits towards the wealthy and impose too great a fiscal burden. Bush eventually got his way, for the most part: He got a really big tax cut. But Bush and his allies did make one key concession: They agreed that, after ten years, tax rates would return to their previous levels. It was a way of accommodating those lawmakers reluctant to impose such huge costs on the federal treasury indefinitely. The Bush tax cuts, in other words, were more than the Democrats wanted but less than the Republicans wanted. And today the Democrats are acting that way. As Zachary Goldfarb noted in the Washington Post on Wednesday, Democrats do not (to my chagrin!) call for allowing all of the tax cuts to lapse. Instead, they call for allowing only those on upper incomes to lapse. For better or worse, they have learned to live with the Bush tax cuts, or at least some portion of them, as part of the fiscal landscape. Republicans have made no similar concession to reality. They want to extend all of the Bush tax cuts and they want to extend them forever. They want to get more than Bush ever could, even though they have less political leverage than he did. Washington doesn’t need two parties that can "come together." It needs one party to "get it together." Maybe Schultz should put that on a coffee cup.